All tours can be customized. All guests receive at least 75 photos, forward by gallery and zip file, within 48 hours after the tour. We will walk through Times Square and New York’s world famous Broadway district. NYC cabs racing by, theaters all around in this fast pace, high energy environment. We then take the first of two subway rides; we exit the subway next to Central Park. Immediately, you will notice a change in the scenery, pace and photo opportunities. We will stroll through the Southeast corner of Central Park, capturing amazing photos of you in the Park and the NYC skyline as a backdrop. We then exit the Park and walk thru the exclusive Upper East Side neighborhood lined with historic townhouses and brownstones. The area was initially settled by the super wealthy New Yorker’s, including the Vanderbilt’s & Rockefeller’s. While this may not be on your itinerary for NYC, we are exposing you to an off the beaten path side of NYC. Naturally, we will give some history and capture you in wonderful photos along the way. We then take our second, and last, subway ride to the Brooklyn Bridge. The views and photos from the bridge are breathtaking. We can customize any tour. For example, If you do not want to include Central Park or The Brooklyn Bridge, and prefer Grand Central Station or more neighborhoods, we can certainly do so. You must keep in mind the logistics of NYC. We will do our best to accommodate your wishes within the time parameter of the tour. We certainly want to maximize our time together. The 2 hour tour will often conclude at the Brooklyn Bridge, at which time you will receive advise from your guide on how to plan the rest of your day. 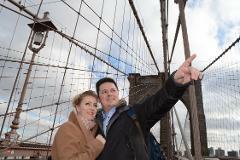 Perhaps you want to continue over the Bridge and explore Brooklyn Heights, Brooklyn Bridge Park or DUMBO. Maybe you want to take a short walk near the Bridge to see the 9/11 Memorial and go up One World Observatory (aka The World Trade Center). Perhaps, as you are now well versed in the subway, you head over to the High Line or The Staten Island Ferry. Whatever you choose, your guide will not leave you hanging. You will have suggestions with clear and concise directions. All tours can be customized, so long as it can be done within the 3 hours of the tour. Please understand, it does not make sense to use our time together waiting on long lines for entry to the Empire State building or Statue of Liberty. You will receive at least 125 photos, sent via photo gallery and zip file, within 48 hours after our tour. We generally have more availability for 2 hour tours. If you do not see a 3 hour tour available, check the calendar for a 2 hour tour. 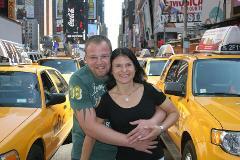 We will walk through Times Square and New York’s world famous Broadway district. NYC cabs racing by, theaters all around in this fast pace, high energy environment. We then take our first subway ride; we exit next to Central Park. Immediately, you will notice a change in the scenery, pace and photo opportunities. We will stroll through the Southeast corner of Central Park, capturing amazing photos of you in the Park and the NYC skyline as a backdrop. We then exit the Park and walk thru the exclusive Upper East Side neighborhood lined with historic townhouses and brownstones. The area was initially settled by the wealthiest Americans, including the Vanderbilt’s & Rockefeller’s. While this may not have been on your itinerary for NYC, we are exposing you to an off the beaten neighborhood. Naturally, we will give some history and capture you in wonderful photos along the way. 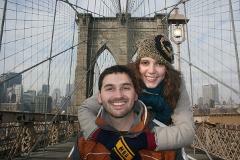 We then take our second subway ride to the Brooklyn Bridge. The views and photos from the bridge are breathtaking. In addition to the above locations, we can include two of the following locations for the three hour tour: Grand Central Terminal, SoHo, Greenwich Village or Brooklyn. We can customize any tour. If you do not want to include Central Park or The Brooklyn Bridge, for example, and prefer more neighborhoods, we can certainly do so. If you prefer more of the Park and less neighborhoods, we can do so as well. We will do our best to accommodate your wishes. Your guide/photographer will certainly make every effort to give you recommendations on how to spend the rest of your day and directions on how to do so. We will meet in the Times Square area. This will allow for several photos with the iconic backdrop so familiar to visitors from around the world. Times Square will be about 15 minutes of the tour. All guests will receive at least 75 photos, via gallery and zip file, within 48 hours after the tour. We will take our only subway ride, two quick subway stops to Central Park. Doing so will allow us a photo opportunity on the subway and a chance to give you a quick tutorial on have to navigate the rest of your holiday. We stroll through Central Park's 843 acres and visit many of the locations made famous by pop culture and movies. Some locations may include Strawberry Fields, Sheeps Meadow, Bethesda Fountain, and The Bow Bridge, to name a few areas. The Park is an urban oasis truly one of a kind. Makes for amazing backdrops of photos. When exiting Central Park, the tour will continue through the charming tree-lined streets and historic brownstones of the Upper West Side neighborhood. Guests will receive at least 75 professional quality photos, via gallery and zip file, within 48 hours after the tour. Guest receive at least 75 photos, via photo gallery and zip file, within 48 hours. We will start the tour in SOHO. Initially settled in the 1600’s, during the 1850’s buildings were construction with wrought iron. The area has many cast iron buildings and cobble stone streets. The neighborhood is both historic and picturesque. Very iconic NYC backdrops. We will take the subway to The Brooklyn Bridge. Your guide/photographer will assist you in understanding how the NYC subway operates. This will be helpful information for the rest of your holiday in NYC. The Brooklyn Bridge. Completed in 1883, was the longest suspension Bridge in the world. Spectacular views and makes for stunning backdrops for photos. DUMBO, (Down Under the Manhattan Bridge Overpass). Dumbo is not quite Brooklyn brownstone and not quite Manhattan glass condo. With its exposed Belgian block streets surrounded by both the Brooklyn & Manhattan bridges, Dumbo has a unique character all its own. In 2007, DUMBO was granted Landmark Status by the NYC Landmarks Preservation Commission. Brooklyn Bridge Park is an 85-acre Park on the Brooklyn side of the East River. The Park has revitalized 1.3 miles of Brooklyn’s Post Industrial waterfront. The views of lower Manhattan make fantastic backdrops for photos.